(Eph. 5:18-21 ESV) 18 And do not get drunk with wine, for that is debauchery, but be filled with the Spirit, 19 addressing one another in psalms and hymns and spiritual songs, singing and making melody to the Lord with your heart, 20 giving thanks always and for everything to God the Father in the name of our Lord Jesus Christ, 21 submitting to one another out of reverence for Christ. Our spiritual disease, which Stone calls book, head, and water union, is amply demonstrated by the fact that, to many among us, this passage is about what it does not say. It says nothing of instrumental music, and so it’s read as a prohibition against instruments. We thereby entirely miss what it does say! It says that we are to “be filled with the Spirit … .” The references to singing are, grammatically, participles hanging on the verb “be filled.” You can’t get the participles right if you don’t understand the verb they modify. Hence, we should not make the least attempt to apply this passage without first exegeting “be filled with the Spirit” — as this is the central point of the passage — and yet this is the one part of the passage the we refuse to read, teach, preach, or understand! And yet from the very founding of the Restoration Movement, Stone himself referred to being filled with the Spirit as a return to the “ancient order of things.” To Stone, being filled with the Spirit is of the essence to restoring First Century Christianity. It’s not about getting the Sunday morning assembly right. It’s about getting the right infilling. Do that, and Paul promises us that we’ll respond to the Spirit’s work in us by singing, giving thanks, and submitting to each other. If your congregation is not characterized by singing, thanksgiving, and mutual submission, then you have a fire problem. You are not filled with the Spirit — and until that happens, the rest of the passage cannot happen. Fire union is unity of the Spirit. It’s the unity that we receive when we submit to God’s filling with the Spirit, when we take seriously the passive voice in Eph 5:18, which says that God himself will fill us — if we’ll just let him. The new covenant (or testament), Jeremiah prophesies, will result in God himself entering our hearts and minds and writing his laws on them. (The entire passage is quoted in Heb 8 to make exactly this point.) It’s about the Spirit’s work in us. (Ezek. 36:26-27 ESV) 26 And I will give you a new heart, and a new spirit I will put within you. And I will remove the heart of stone from your flesh and give you a heart of flesh. 27 And I will put my Spirit within you, and cause you to walk in my statutes and be careful to obey my rules. The prophecies all point toward the coming Spirit — not to baptism, not to better Bible study, not to deeper hermeneutics — but to the Spirit placed by God in our hearts and minds to change us — transform us — so that we become more and more like Jesus and thus more and more united. (2 Cor. 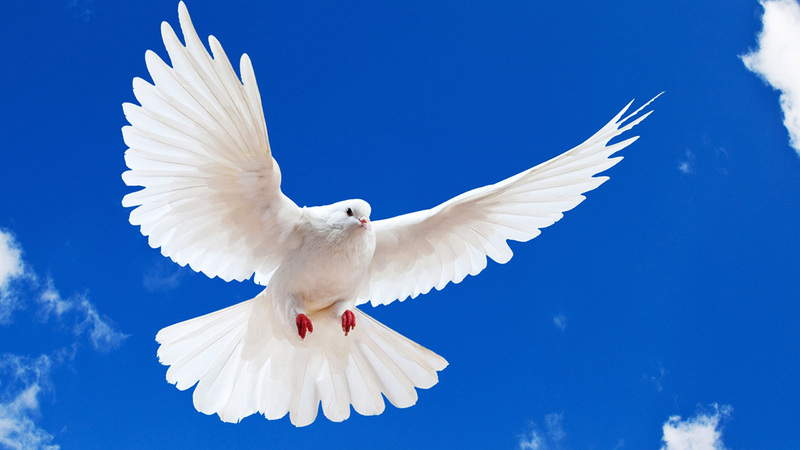 3:17-18 ESV) 17 Now the Lord is the Spirit, and where the Spirit of the Lord is, there is freedom. 18 And we all, with unveiled face, beholding the glory of the Lord, are being transformed into the same image from one degree of glory to another. For this comes from the Lord who is the Spirit. (Rom. 8:29 ESV) 29 For those whom he foreknew he also predestined to be conformed to the image of his Son, in order that he might be the firstborn among many brothers. The Spirit transforms us into the image of the Lord. We become like Jesus! And as we become like Jesus, we find ourselves united — not by our efforts but by the Spirit’s work within us. If we are willing to submit to the Spirit’s transforming work. If we’ll let God’s holy fire transform us. And if we’ll recognize the transformation he is performing in others — who, like us, are far from perfect but nonetheless seeking to be obedient to the One who also fills them with the Spirit. The “retiring” of the Spirit at the end of the Apostolic era of the church is, perhaps, the greatest mistake of the SCM. We should have listened to Stone more than to Campbell. Although Campbell was irenic in his view of “the denominations,” his readers did not share that spirit of unity. Campbell denied any intention of making his series on “The Ancient Order of Things” in any way creedal – but his readers made it that anyway. In reacting against “direct operation of the Spirit,” we went to the extreme of “no operation of the Spirit” – and in effect became Deists, except that we did admit “providence of God’ (not through the Spirit! }, but had difficulty explaining that in terms of our pervading theology and pneumology. Instead, we focused on soteriology and ecclesiology – how to be saved and how to do church. This meant we became enamored with the five steps, the five acts, and the five offices (apostles & prophets – both of which were limited to the first or second generation of Christians – with only evangelists, pastors, & deacons remaining to the present). This led to our insistence that “we” are right; everyone else is wrong; hence, everyone else is condemned. And what began as a “unity movement” became something horribly different. This is not to say there are not many good people with devout faith who are serving God as best they know how. The problem is that too few have been willing to extend this same grace to others. The Ephesians 5 passage which calls us to be filled with the Spirit is what I liken to an in-house evidence and experience that God is with the saints in the fellowship of the saints. The speaking, singing and thanks which proceed from the mouth of the saints is the evidence that they are indeed filled with the Spirit. A different passage and one which illustrates what I liken to an open-house evidence and experience for the saints of the same call to be full of the Spirit, is Acts 6. There, the evidence and experience that God is with the disciple is illustrated in the life and work of Stephen and Philip. They both actively, powerfully and confidently proclaim Jesus. I find Stone’s understanding that being filled with the Spirit is “the essence to restoring First Century Christianity,” however well-intended, as vague and not as closely aligned with the teaching of the scriptures (Ephesians and Acts) for the saints in Christ. It is neither a vague nor mysterious truth as to how one is filled with the Holy Spirit; which it bears worth noting is not to be mistaken with receiving the indwelling of the Holy Spirit. This is the marvel of being filled with the Holy Spirit that as we empty ourselves while proclaiming Jesus to the nonbeliever or speaking his words among brothers and sisters He continually replenishes and refreshes in us those rivers of living water which proceed from our innermost being. I have always (consciously since July 1983) struggled with the “indwelling of the Holy Spirit”. I have read both sides of the argument — personal indwelling vs through the word indwelling — and I am still unconvinced. Doesn’t the Holy Spirit change us through the word, which He revealed, embedded in our hearts/minds? Is there another way in which He changes us to conform to the image of the Christ? And, if He personally indwells us, why would we need the Word (Bible) to guide us? Do you believe in the indwelling of unholy spirits? I find it very sad that a church still struggles with the question as to whether or not God dwells within the child of God. “Word only” is what I heard as a child. But, I finally reach the point where I could not believe in a God so small. God lives in every child. And the fact that the Church of Christ is practically the only church that has a measurable number of members believing in “Word only”, does not make it “faithfully unique”…just slow to grow. I always stumbled upon “word only” because I knew deep within that God is not limited to the Book. He is the author of the Book. The Book points to Him and urges us to go “beyond the sacred” pages and know Him through our experience of Him. I always hear the Book screaming, “Know the Author!” The Author says, “And you will seek Me and find Me, when you search for Me with all your heart,” Jeremiah 29:13. He is beyond the Book, isn’t He? He gave us the Book as a Milestone / Signpost which points to HIM. We have to find HIM. Nothing else will satisfy. «There Will Be A Day!